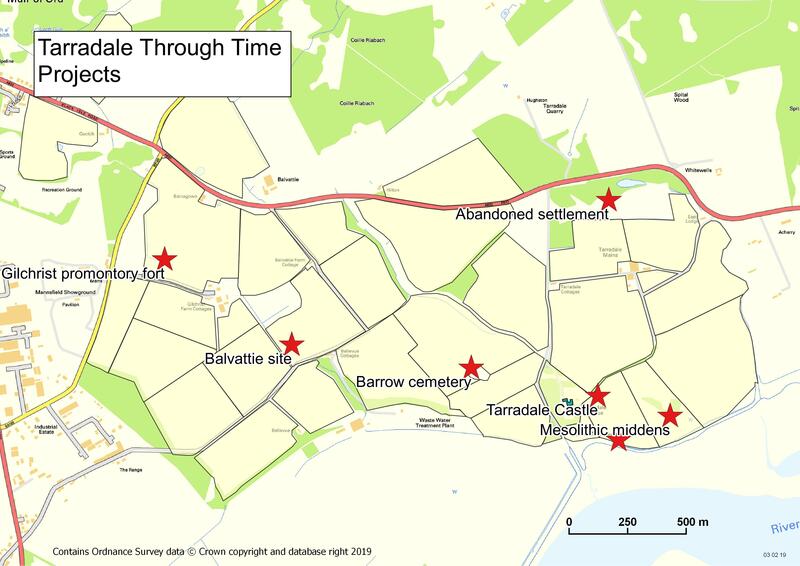 In September 2018 two sites were investigated by TARRADALE THROUGH TIME near Muir of Ord. These were a fortified enclosure just west of Gilchrist church and a rather enigmatic and possibly ritual site south of Gilchrist church, but located on Balvattie Farm. The Gilchrist fort is a rather unusual monument and walking past it gives no clue to its existence, size or age. Canmore describes it as a promontory fort based on their interpretation of crop marks as the arcs of three concentric ditches “Apparently designed to cut off approach to a tongue of low-lying and comparatively level ground running NW into marshland, they are in effect part of the defensive system of a promontory fort measuring about 85 m by 30 m”. 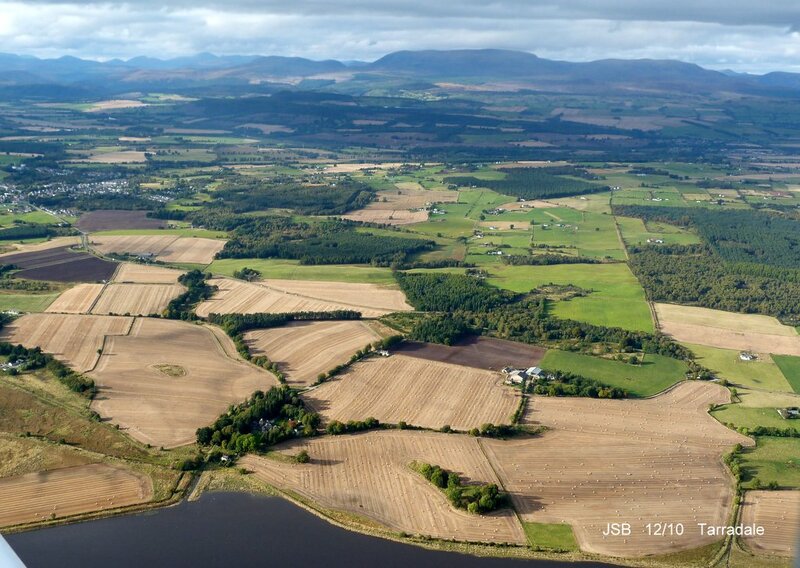 In addition to the black-and-white photographs on the Canmore database, the late Jim bone, who was an enthusiastic archaeologist and also a pilot, took some good colour photographs of the site. Jim’s aerial photograph shows three dark green curved features representing the fort’s ditches on the east side of the promontory. 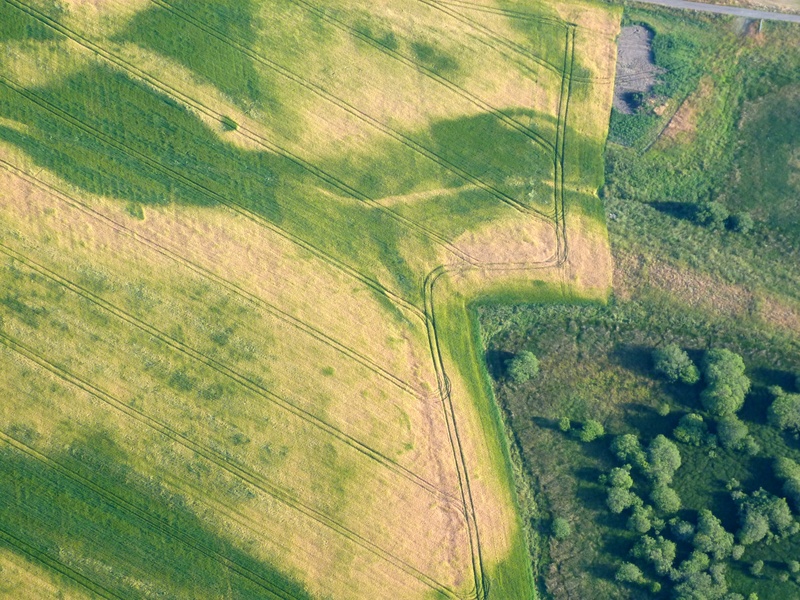 The ditches are now under cultivation and have been filled in and ploughed flat so there is nothing to see above ground; it is only the aerial photographs that have encouraged archaeologists to see this as a fortified promontory. It is unusual to find a promontory fort inland unless it is in a situation like this where it is surrounded by water or marshland. 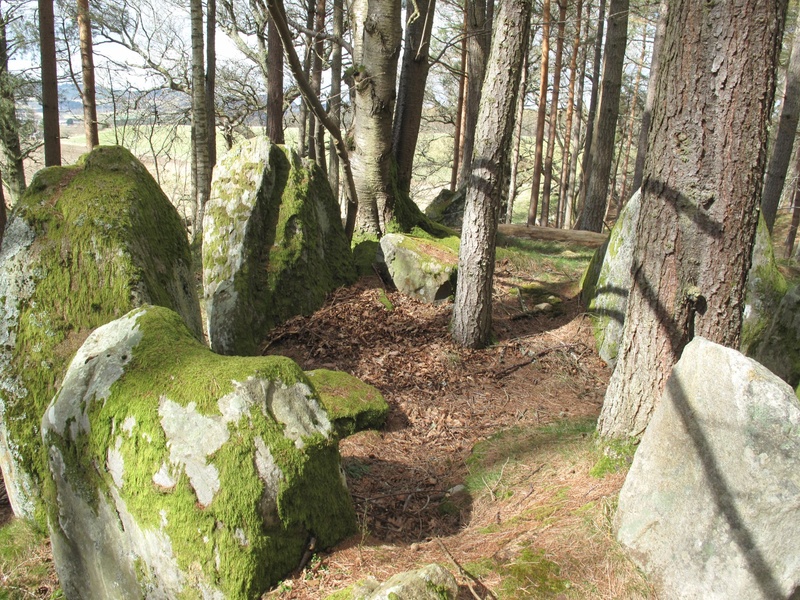 Most hill and promontory forts in Scotland appear to have been constructed during the late Bronze Age and Iron Age and the latest ones were built or reoccupied in Pictish times. Our research agenda sought to identify and characterise the ditches, and to ascertain when the fort was constructed, how long it was occupied and what activities may have taken place there. Three large trenches were initially opened, one running at right angles across the defensive ditches, a second running from the long side of the fort down into the bog and a third on the highest part of the interior of the fort. 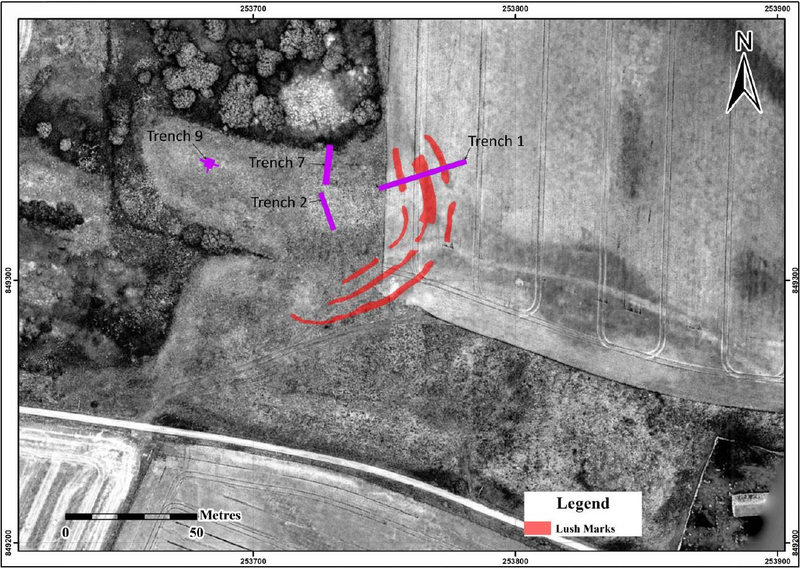 We were very quickly able to establish that the three ditches seen on aerial photographs did exist, with a hint of a fourth ditch closer into the fort. The outermost ditch was reasonably shallow but the second ditch was a massive construction 5-6 m wide at the top and sloping steeply to about 1.5 m below the plough soil though we consider that the upper part of the ditches have been lost due to ploughing and the intervening banks of excavated material flattened. The third innermost ditch was not quite so deep, but right on the edge of the actual fort area we found what may be an inner ditch that might have continued round the fort perimeter as a wall and perhaps with a timber fence palisade on top or just in front. This entry was posted in Black Isle, Bronze Age, Excavations, Iron Age, Neolithic and tagged aerial photography, clay floored building, crop marks, crucible fragments, ditched enclosure, Gilchrist Chapel, Gilchrist promontory fort, iron age hillfort, Medieval ceramics, Neolithic pits, palisade, post hole, quern stone, Tarradale Through Time on March 11, 2019 by nosas.